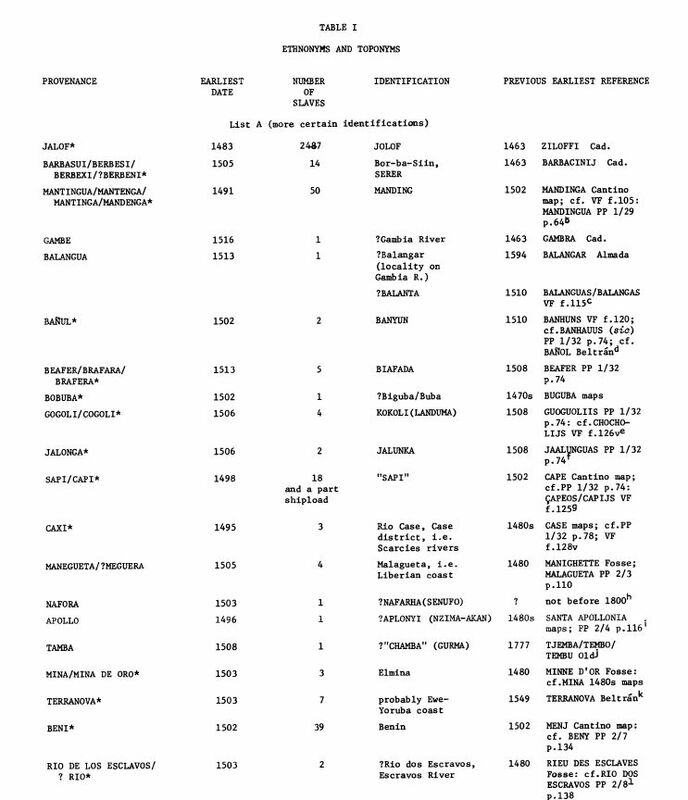 This page features charts listing the ethnic origins of slaves as they were mentioned in historical documents (testimonies, registers, notarial acts etc. 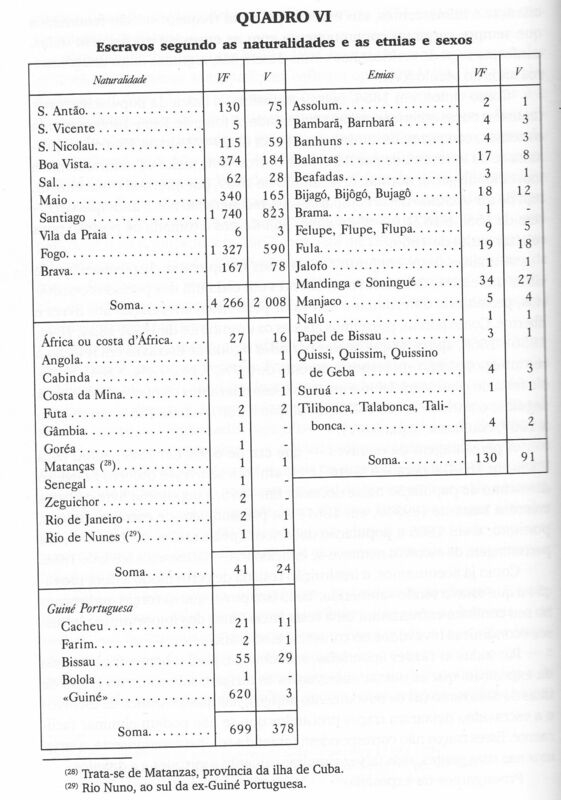 ), not only for Cape Verde itself but also places where slaves exported from Cape Verde ended up. It should be noted that the ethnic labels used in documents dating from the colonial era can contain many flaws. Still caveats aside the socalled “castas” or “nations” being used in historical documents/literature do offer very valuable information. Indicative at the very least of the geographical and linguistical origins of the persons being described! Cape Verde being a slave entrepot in its early history (offcially from 1466-1647) obviously most slaves might have entered and consequently left without anything being documented about their ethnic origins. Then again what we do have is very valuable in itself, especially when combining all the scattered info also avaialable from Latin America & Iberia and counterchecking with DNA research, linguistics and cultural retentions. 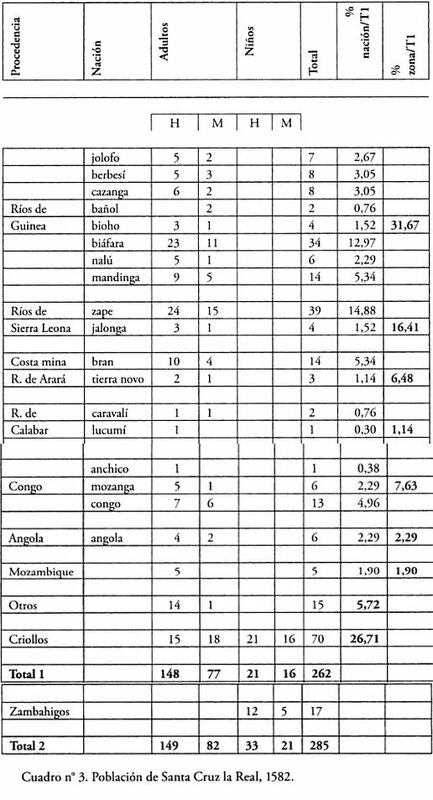 When it comes to documentation from Cape Verde itself the samples are rather small for the most part and also none for the main period of slave trading in Cape Verde, the 1500’s. However looking at the documentation that survived for other places we can get a better picture. 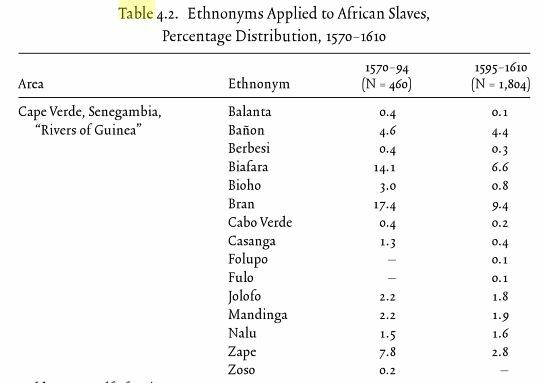 The very first isolated references to the ethnic origins of indivual Cape Verdeans seem to have been in 1541 to a Banhun forro (free black) and in 1543 to a Wolof slave in Fogo. VERY CRUCIAL documentation to have survived especially because we don’t have similar records from Lisbon or Sevilla who had bigger slave markets than Valencia. Given the known slave trade patterns it can be assumed that most of them would have been brought by way of Cape Verde aside from Arguin (Mauritania). Both historians and linguists have considered it representative for the ethnic composition of Cape Verdean slaves during that specific time period. An absolute dominance of slaves labeled Jalof, almost 85%! Most frequently mentioned after them are Mandinga, Sereer, Sape and Benin (most likely referring to the kingdom of Benin in presentday Nigeria). Not really surprising given what we know of the trade patterns back then. The horse trade with the Jolof empire conducted by both Portuguese and later on Capeverdean based traders being principal already from the 1440’s or so. 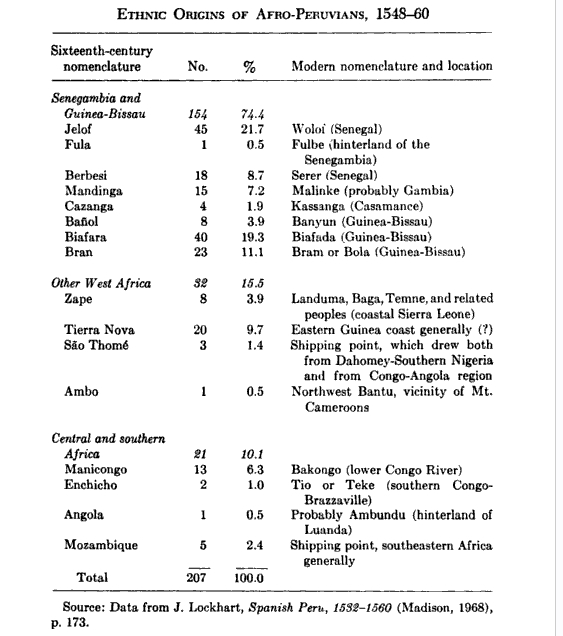 One important thing to keep in mind though is that most of the Valencia documents seem to refer to the Jolof empire intending to specify geographical origins and not ethnic ones . So Jalof/Jolof/Gelofa etc. cannot always be equated to the Wolof ethnonym as we know it today. It may very well also refer to people we would nowadays identify as Fula, Sereer or Lebu. From historical travelling reports it seems that Wolof kings raided for captives both among their own people, especially during civil wars and also among neighbouring states while expanding their territory until 1500. After 1500 the Jolof empire started to disintegrate and especially the breakaway provinces and the Sereer in the south (Petit Coté) had many succesfull wars against the leftover state of Jolof in the interior. 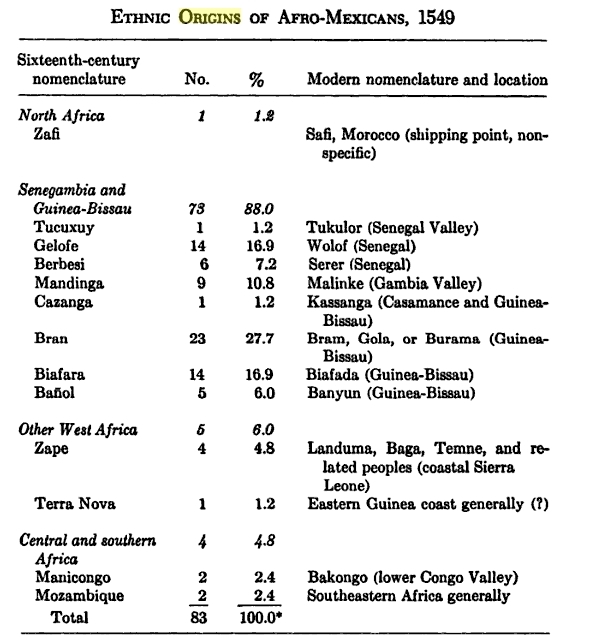 Perhaps therefore in the period 1500-1560 the share of ethnic Wolofs might have been higher among those labeled Jolof. 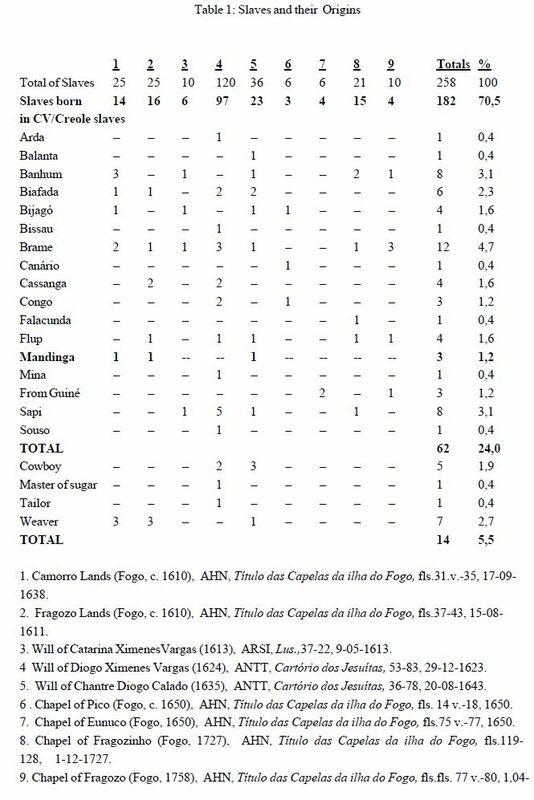 70,5% of all slaves were Capeverdean born; in batch 4 – the biggest one from 1624 – it’s even 80% (97/120)! Implying that their ethnic origins reflect slave imports from earlier time periods in the 1500’s. There’s 1 Mina and 1 Arda from the Ghana/Benin area being mentioned as well as 3 Congo’s. 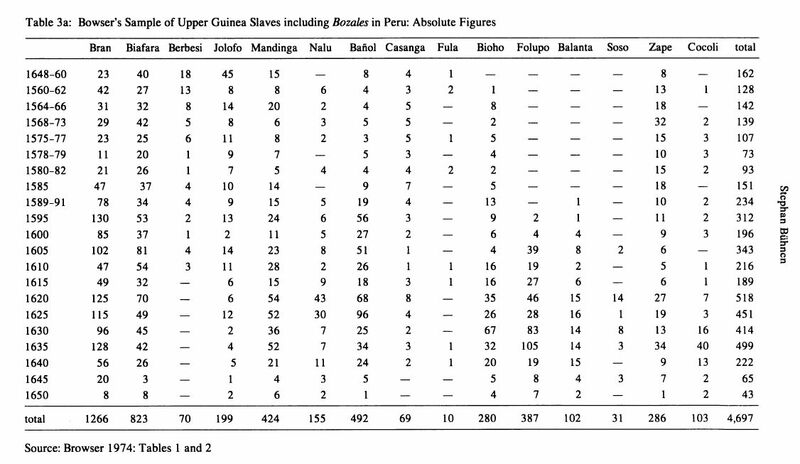 Solid prove that slaves with origins outside of Upper Guinea also ended up in Cape Verde even if a small minority. Also 1 slave being labeled “Canario” in a will dating from 1635. That’s the only historical reference I’ve ever seen for a Canarian slave in Cape Verde. Not sure if by this time it could still be someone with Guanche background but intriguing either way! Small sample but interesting comparison with similarly small ones from several Latin American countries. Especially the Bram (=Papel), Beafares (=Beafada) and Sape (=mostly Temne) seem consistent. The bulk of Cape Verde’s slave population would have been imported in earlier periods than for Latin America because it was being settled almost 50 years earlier. 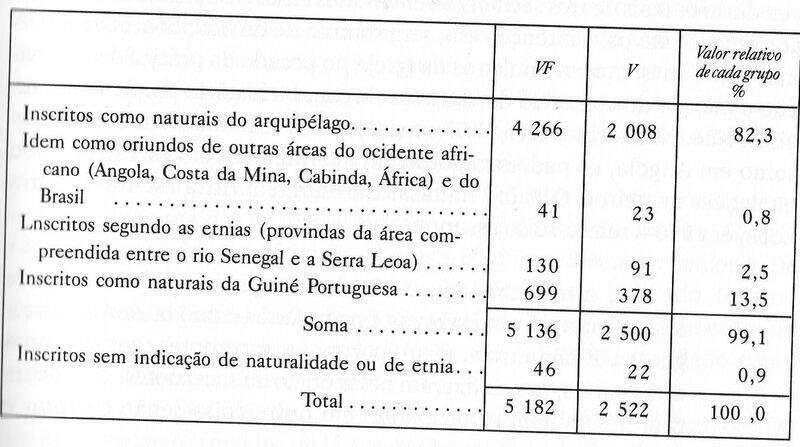 Any substantial expansion of Cape Verde’s slave population needed for domestic purposes seems unlikely after 1550. Except for replacement additional slaves being needed to remain on Cape Verde might have been relatively few therefore. Creolization and the share of native born Capeverdean slaves might have been relatively high, again resulting in reduced demand for slaves. 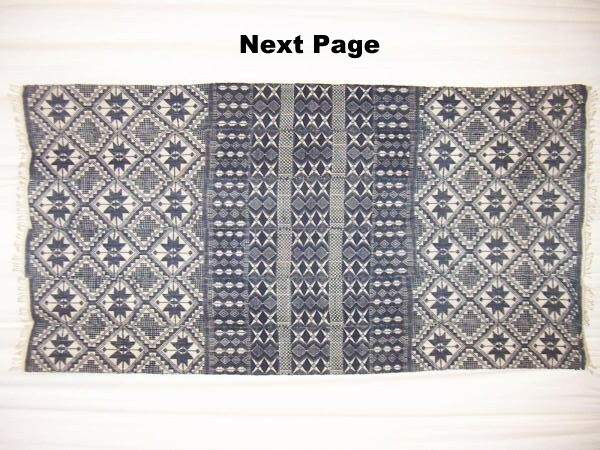 Because of Cape Verde’s pano industry slaves from ethnicities known for their weaving skills may have been preselected to be kept on Cape Verde while others were allowed to be exported to the Americas. 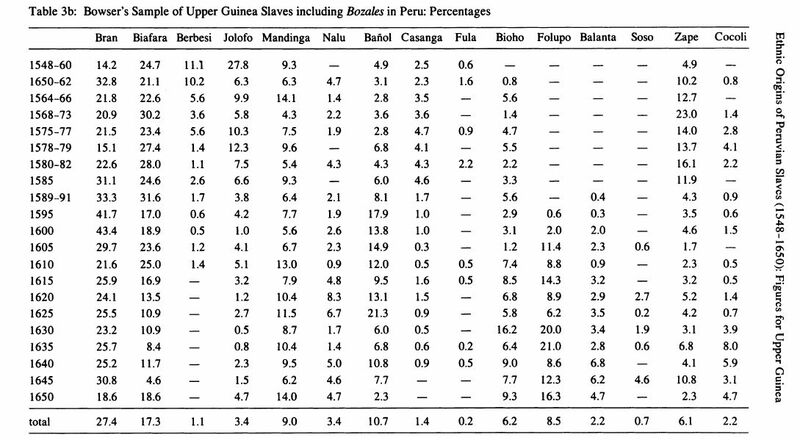 Capeverdean slave owners being very knowledgeable about Upper Guinean ethnicities and also having first pick they could have had several other ethnic preferences as well. This is by far the largest sample available. The archives in Peru being relatively well preserved. Very valuable also because of the extended timeseries. These early samples also included in the previous batch but more likely to fit with the ethnic composition of Cape Verde’s slave population during that same period. Again early samples but this time from 1 single source. Just like the Peruvian samples these should be statistically significant. Shorter period though, perhaps because Peru continued to import Upper Guinean slaves (via Cartagena) for a longer time than Cuba which made the switch to Angolan supplies early on in the 1600’s (like Mexico). Very interesting sample taken from a pacified Maroon village. These Maroons had been waging a guerrilla war against the Spanish for several decades before settling for peace. They also cooperated with the wellknown English pirate Sir Drake! They were organized in several small bands usually dominated by 1 ethnical group. It is said that the most veteran warrior leader was a Wolof. These samples partially contain the ones posted earlier from Peru & Mexico. But also some from Dominican Republic & Colombia. Unfortunately it seems less documentation on ethnic origins has been preserved in Cartagena & Santo Domingo which were the main ports of entry of Upper Guinean slaves into the Spanish Americas. Again some duplicate samples but these timeseries show very clearly how major political events like the Mané invasion of Sierra Leone could drastically change the composition of slave imports. Not only to be seen from the % of Sape but also notice the increase of Susu during 1560-1567 and its decline afterwards. 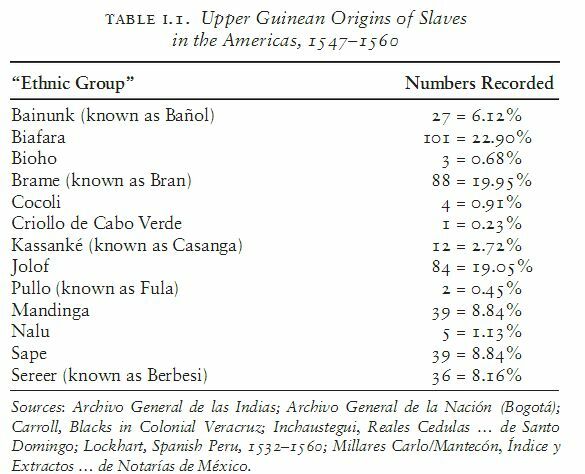 Also notice there’s only very few slaves referred to as ” Criollo de Cabo Verde”, implying that locally born Cape Verdean slaves being exported to the Americas were uncommon. Slave exports by the Portuguese to the Spanish Americas from Upper Guinea came to an end after the very last assiento of 1695-1701. Only during the illegal slave trade of 1810’s-1830’s it resumed with Cuban ships visiting both Cape Verde and Guiné Bissau. 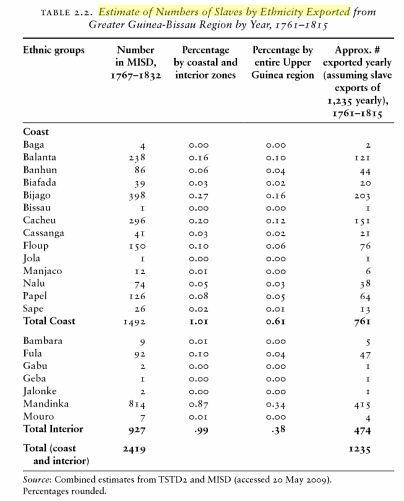 In the meanwhile however Guiné Bissau’s slave trade was done almost exclusively with northern Brazil (Maranhão & Para), because of favourable oceanic currents. From these samples it can clearly be seen that in the 1700’s there was a shift of slave sourcing to the interior, with many Mandinga captives being represented. They are by far the most numerous (34%). Also noticeable how the Balanta, Diola and Bijago are more prominently present than the Papel (many labeled as “Cacheu “ could also have been Papel though). They apparently got exposed to the slave trade to a greater extent than in the 1500’s/1600’s. 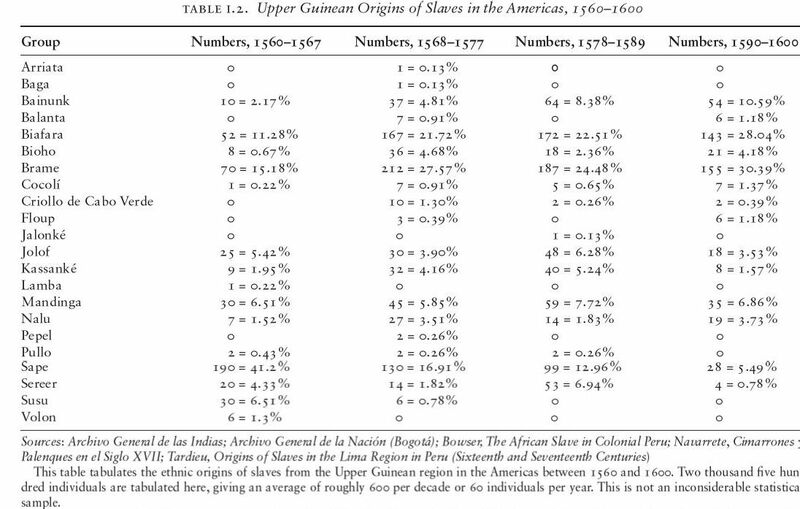 Most likely the same pattern occurred with Guinean slaves being imported into Cape Verde during this period.